Oh yeah, this happens to me all the time. Nothing like a melting eyeball to derail your train of thought. The letting in this comic is beautiful. Your interest in perfecting your lettering perfectly coincides with when Schtein is coo-coo and can be well-represented with slightly-wonky letters– but it really is gorgeous! The angles and stuff really show the chaos he’s in the midst of. Yea, it was starting to bug me too. Even ones that are inspired by my own ineptitude. Not your lettering. Bex’s misspelling of the word lettering. Your lettering is pretty good. I don’t think that’s what the person I was responding to was talking about. In my opinion, the lettering is fantastic, if a little unorthodox. But then, so are LSD trips. Yeah, I would crawl into a corner, too. That lady is scary as hell. Oh my gosh a HINABN reader <3 Day is complete. 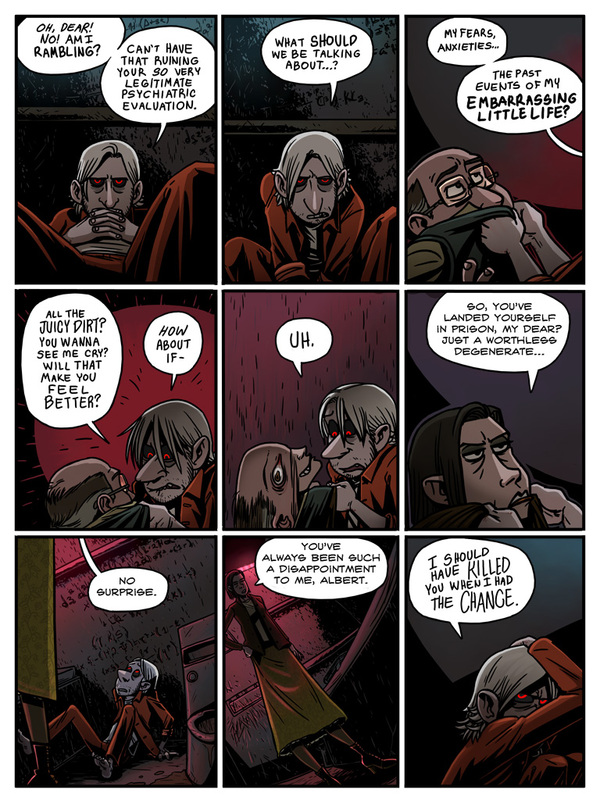 Also, I have directed that look Stein has in the last panel towards my grandmother many times. hahah, whhaaat, you never picked up phrases or turns of phrase from your parents or guardians? I got to calling people ‘tards’ from my mother. My Dad says, “We ain’t building no piano.” Yea… I say it now too. Schtein looks like a pin-up model or something in panel 2. Why do I have the feeling that this will end badly? Oh my word that melty panel scared me. Blow that thing up and put it out on your door come Halloween it will SCARE THE CRAP out of everyone. xbkvbasjbck nope. Can’t come up with anything clever or constructive to say. That’s how awesome this page is. I cannot wait to see where this scene is headed. Also, “uh” is about the best way ever to respond to someone’s face melting off. Schtein, you are so cool. I don’t usually comment, just admire silently, but this page is one of my favorites of the entire comic. The two starting panels have really nice perspective to get the full effect of that deep Schtein-glare. It goes so well with the crazy-scrawl behind him. And it hardly needs repeating at this point but the face-melt is just great. There was always the hints of a bad trip, I feel like its just coming to the foregound now. Schteins’ expressions and corresponding lighting are also excellent. I can’t help but wonder how the doctor is viewing all this while its going on. A guy goes from gripping your collar to hatefully cowering on the ground, what the heck do you do?? Can’t wait for the next update! I assume that Schtein is going to enjoy talking to his hallucinatory mother-phantasm less than the shiv fight. Last panel = DO NOT LOOK AT ME. I AM DRACULA. BLEEH. Awesome page, can’t wait for the next. I’ve been enjoying String Theory from the beginning, but the hallucinatory direction the art takes has really made me love it. I SO want to buy this comic. The funny thing is, the LSD wore off like an hour ago. This page may have been the only time when I’ve ever read a comic and thought “Holy crap that would look good animated.” If only for the melting eyeball. You really like faces melting. I like that. I’m quite enraptured by Schtein’s drug-induced mind-peregrinations. I would, however, note that this atmosphere of hallucinatory discombobulation could be brought to greater saliency through more imaginative panelling. Not that there’s anything outright wrong or bad about a regular rectangular layout, but I can’t help but think that a more compelling effect could be achieved by, say, making the panels in some way ”melt” into one another. And they need not necessarily be in customary left-to-right order. (For a more trenchant dissertation on this subject I highly recommend the various blogs of the artist of Dresden Codak). I would also note that the lettering of Schtein’s invidious retort in the last panel is of relatively clear and even positive aspect. Making the lettering more erratic and downward-slanting might better convey his murderously nebulous state of mind. On the whole, though, I very much like this comic; keep up the good work! I have been playing with mixing it up a little bit, because I’ve been getting bored with my regular panelling, but definitely could stand to push it more. I don’t know. I’m not well experienced in it, all the comics I grew up reading have simple block panelling like I do… And I’ve always been more concerned with ease of reading than crazy layouts. It’s so easy to hinder the story with unreadable things like dabbling with counterintuitive right to left things… I think the only way you can achieve that is if the line of action is flowing that way, right? Or something like that. I saw that done well once. It was pretty neat. But there’s no action line in these pages to draw eyes directions. Maybe on the previous page it would have worked. It was a lot more hallucination driven. Not so much this page, I think, since I was going for a steady rhythm, hence all the boxes being the same size and shape. Oh well, that’s okay. It’s all things to think about. Well, things I do already think about and worry about constantly. Ha ha. Perhaps in the future I’ll be better at this.